You know, sometimes a lot of the time when it comes to making recipes I'm kind of flying blind... I get an idea in my head and I need to make it right that second. A few weeks ago I said to Jesse "Oh, I'm going to make a Chocolate Panforte" (except at the time I was calling it a Paneforte because I really didn't know what I was talking about). "Oh, you are? Er.... what exactly is that?" was the response I received. And to be honest - I didn't really know how to answer Jesse's question. 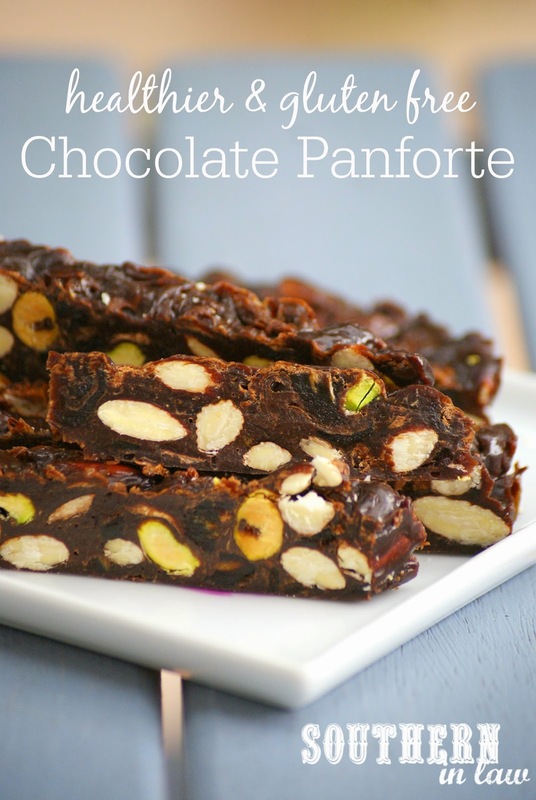 You see, I'd seen Panforte, I'd eaten Panforte, but I'd never tried to make it myself. I really was flying blind - but I new I needed to combine fruits and nuts with a toffee to hold everything together and a little bit of flour. I also decided I wanted to make a chocolate panforte, so I had to add chocolate in too - and to make it even more difficult for my brain, I decided I wanted to cut the refined sugar and make it healthier too. I do say I love a good challenge! So I set to work to create the ultimate combination. 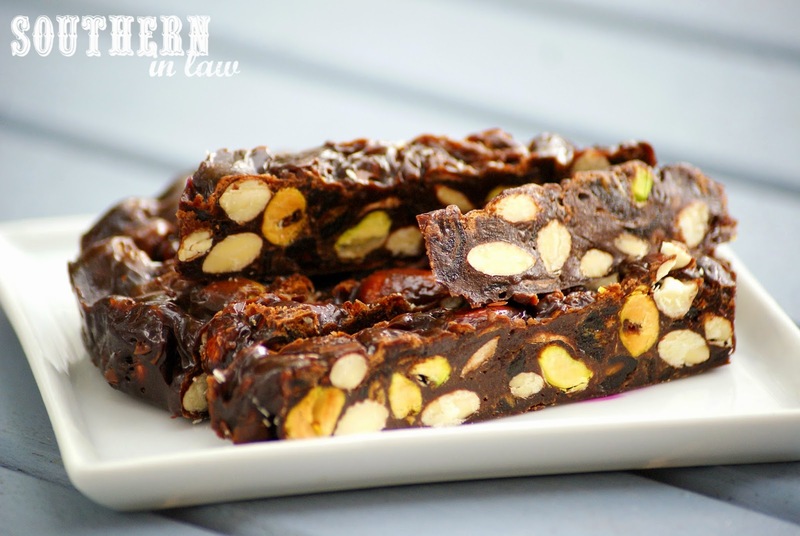 Chewy dried fruit, crunchy nuts and just the right amount of chocolate. After a failed attempt, I came up with the perfect foolproof recipe which is super easy to make and super adaptable and you don't even need a candy thermometer! (Because really, whenever I read the word candy thermometer in a recipe I whimp out and shove it in the too hard basket). 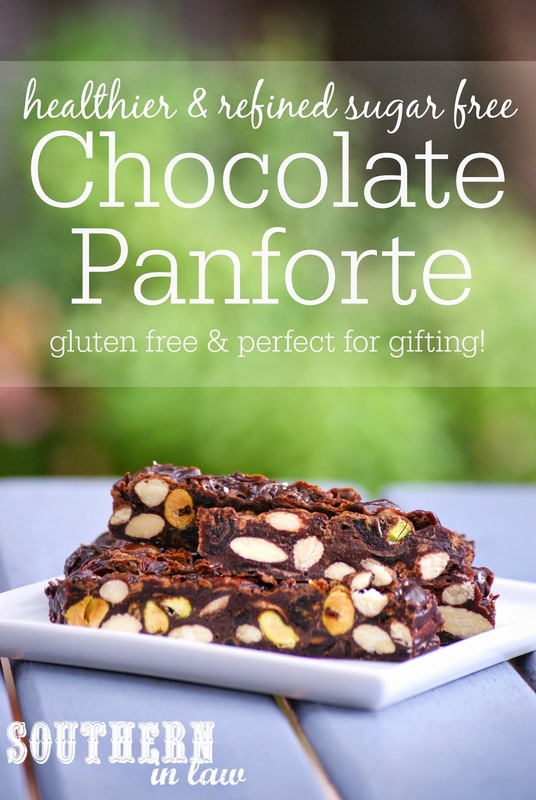 Katrina and I are currently obsessed with this panforte. I've made three batches since the original with different nuts and fruits and it's so so good. We keep it in the fridge and cut off slices whenever we want something sweet. As you know if you've been reading SIL for a while, my sister Katrina is super fussy - so when I asked her what she thought of the panforte I was preparing myself for the worst..... but instead I got the opposite. But this panforte is the perfect Christmas treats for many many reasons. Not only is it super easy to make, it looks impressive (so your friends will think you're a genius - which you are, obviously! ), tastes amazing and you can make it well in advance as it will keep in the fridge for 2-3 months! Boom! Perhaps my favourite thing of all though? You can adapt this recipe to suit whatever you have available or whatever is on sale. In the pictured version we used Unsalted Roasted Pistachios, Natural Almonds and Dates (our favourite combination) but you can use a mix of whatever dried fruits/nuts you like! Grease and/or line a round cake tin or 3 mini 4" cake tins (just ensure your smaller cake tins are deep enough - we used mini springform tins) and set aside. In a medium mixing bowl, combine your flour with your nuts and chopped dates and set aside. Add your brown rice syrup, coconut sugar and mixed spice to a medium saucepan with your water and heat over a medium high heat. Meanwhile melt your chocolate either in the microwave or on the stove in a double boiler set up. Bring your rice syrup mixture to the boil, stirring until the mixture thickens and the sugar dissolves (1-2 minutes) and then take your mixture off the heat. Mix your chocolate mixture into your toffee mixture and then pour over your fruit and nut mix, stirring to combine. Pour your paneforte mix into your prepared tin (or tins) and flatten and spread the mixture out. You may find it's easiest to either use a piece of baking paper to push the mixture down or a lightly greased spoon/spatula. Bake your panforte for 15 minutes in your preheated oven and then leave to cool on your bench top or on a wire rack before placing in the fridge to chill completely. 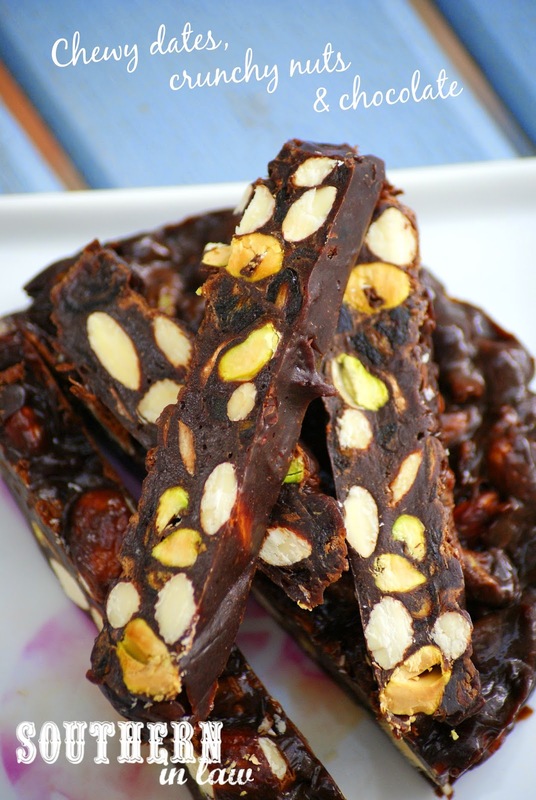 Once your panforte is chilled, remove it from your tin(s) and serve or wrap for gifting! You will need to keep the panforte in the fridge to stop it from becoming too sticky (so be sure to keep your wrapped gifts in the fridge prior to sharing them with friends) and the finished panforte will keep for 2-3 months chilled in an airtight container in the fridge. Our tips for storing your panforte: When storing your panforte in the fridge, place it on a sheet of baking paper (or multiple sheets if making multiple mini panfortes) to make it easier to store and slice. You can also cut up your entire panforte and store the slices wrapped in baking paper so they don't stick back together! *You may also use raisins, figs, cranberries, mixed peel or whatever dried fruits you like. We found we preferred using a mix of dried fruits, always choosing dates or raisins as somewhat of a "base" and then adding in other fruits - but the choice is yours! **We like almonds and pistachios best for this recipe, however, we also loved using walnuts, cashews and pecans so the choice is yours as to what you want to use - just use 200g of whatever nuts you like best or have on hand! ***If you want a rich chocolate panforte take out 1 tbsp of flour and replace it with 1 tbsp cocoa powder. But tell me, are you like me and kind of make things up from a random idea - or do you prefer to stick to a recipe? What's one Christmas recipe/treat you'd love to try but haven't had the chance to? It is so good - and the perfect combination of all things good! I hate to sound like a dummy - but what is 'mixed spice' and what would be in that? And I answered my own question by doing a search on your blog! Thanks for posting the answer! Hey Aims, sorry for my late reply - but I'm glad you were able to find the answer! You'll have to let me know what you think of the recipe when you try it! Wow!!! Thank you for this recipe! I have always looooved panforte, but my previous favourite recipe was rather heavy handed on the white sugar. I love what you have done to makeover this recipe for those who are conscious of avoiding refined sugar and gluten. I made a couple of tweaks of my own and it still worked out perfectly: substituted macadamias for the pistachios, increased chocolate to 100g (and melted it directly in the same pan as the rice malt/coconut sugar mixture instead of melting by itself) and added extra cinnamon and finely grated zest of one orange. Absolutely superb!